Pendulum Effect Once per turn: You can target 1 DARK Spellcaster-Type monster you control; apply this effect to it, then destroy this card. Once applied, double any battle damage that monster inflicts to your opponent this turn if it battles an opponent’s monster. If this card is destroyed by battle or card effect: You can add 1 “Pendulumgraph” card from your Deck to your hand. Looking into the most popular deck in Tier 1 this week, Pendulum Magicians, and starting off with Double Iris Magician. Highly searchable, Double Iris as a Spell can double any battle damage a DARK Spellcaster does this turn to a monster. A handy effect that, while it doesn’t immediately help out with field prescience or hand advantage, does add up over time. That little extra damage may stop a card that requires LP. It’s scale is eight, opening up most of the summons for the monsters used in the deck. As a monster, Double Iris can search a Pendulumgraph card from your deck once it is destroyed in some fashion. It doesn’t matter who destroys Double Iris, just as long as it is destroyed. It doesn’t have to go to the grave either to activate, another bonus. Star Pendulumgraph will protects Spellcasters from Spell cards, and Time Pendulumgraph protects against Trap cards. Double Iris offers protection searching, and can always be Pendulum Summoned back to the field. Double Iris is a great card for Pendulum Magician. It could also be used as tech for DARK Spellcaster decks that use scales, but mostly it is for its own archetype. I went ahead and picked the cards for this weeks Card of the Day reviews and with the rise of popularity in the Pendulum Magician deck, I thought this would be a great week to look at some of the Pendulum Magician cards from the Pendulum Evolution set that came out a few months ago, the first one being one of the best Pendulum Monsters in the deck, Double Iris Magician. 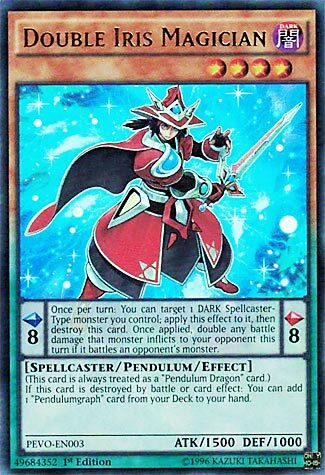 Double Iris Magician is a Scale 8, which is outstanding, and you can destroy it in the Pendulum Zone to let a Dark Spellcaster deal double damage when it battles a monster that turn. More damage is lovely, but this is just an easy way to get the monster effect of this card off. For a monster effect, when it is destroyed, you can search for a Pendulumgraph card from your deck. Both the Pendulumgraphs, which we will review this week, are staple in the Pendulum Magician deck, so getting to search for them is very powerful. Also, this card is always treated as a Pendulum Dragon card, so Duelist Alliance can search this thing. This is an outstanding card for the Pendulum Magician deck as it can help begin the plusses they can generate. Three is mandatory in modern Pendulum Magician decks. Double Iris Magician opens up this Thanksgiving week. First off, let me say, that I feel this card could be useful simply as a Pendulum card. Spellcasters can obviously make beautiful use of this card. Being an 8 on the Pendulum scale is wonderful thing. This card does shine rather brightly in the Pendulumgraphs Magician Deck as well. Letting you search for any card of the name from your Deck when destroyed by Battle or Card Effect. To get the most out of this card, you’ll want to be running the latter Deck, but as I said in the open, at the very least, it’s a good piece of Tech even just for a Spellcaster user. This should be used and abused, at least until/if it’s hit by the Ban List. Starting off this week, we’re taking a look at Double Iris Magician, a level 4 Dark Spellcaster with 1500 attack and 1000 defence. Iris comes with a scale of 8 just for facilitating those higher level summons. Iris’ pendulum effect lets you inflict double battle damage if a Dark spellcaster battles a monster this turn, then destroy Iris. In conjunction with Purple Poison Magician or any other stat boosters, Iris quickly makes a spellcaster a frightening force. Her second effect is that when Iris is destroyed, she searches for any pendulumgraph spell or trap. Granted this is currently limited to Time and Space, it’s not really much of a hindrance at the moment as she gets her effect when destroyed from anywhere. Iris is also always treated as a Pendulum Dragon and really helps out the summon of Z-ARC, aswell as making her searchable through the spell card Duelist Alliance. Next articleYuGiOh Duel Links is now on Steam! Free to play!